Besh Birders refers to Besh Barmag, a sacred mountain in Azerbaijan. This unique place has been identified as a major bird migration bottleneck in the last couple of years has become a key region for all team members in the course of their birdwatching careers. 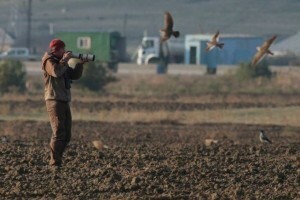 The very idea of forming a team for Champions Of The Flyway arose there, right at the shores of the Caspian Sea, while watching migrating larks and buntings. Though born in different places all over Germany all of the team members spent a part of their lives in the small city of Greifswald in Northeastern Germany close to the Baltic Sea. Even though half of the team hasn’t been to Israel prior to this trip, they are keen on creating a lasting impression in the COTF – and first of all they’re looking forward to having a great time while birding in the desert! Let’s get it started! Kai Gauger is birdwatcher and conservationist since his childhood. He studied biology in Tübingen and landscape ecology in Greifswald, where he got in touch with Azerbaijan. From 2004 on he is visiting the country annually, has written his diploma thesis about wintering Little Bustards, worked in many projects about breeding and migrating birds and became addicted especially to Besh Barmag. His other passion is guiding tourist groups through this highly diverse country. At home he lives with his family, works as a freelance ornithologist and loves growing his own vegetables and fruits. 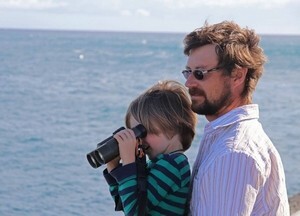 As a child, Andy Siegmund experienced his first ornithological adventures on several bird migration camps organized by the environmental association NABU. While growing up to be a passionate birdwatcher, he realized the importance of nature protection. 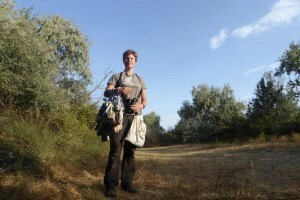 During his study periods in Greifswald he met like-minded-people and since then, he takes part in various bird research projects all over the world. Christoph Himmel discovered the passion for birds quite late but since then: no day without birds. During his study at the Greifswald University in Germany, he met Michael and Pia and after his first visit of the fascinating birding destination Azerbaijan, he was infected with the Azerbaijan-Virus. In the following year he conducted a successful shorebird research project, which he now tries to establish on a regular basis. Pia Fetting became a bird enthusiast during a voluntary ecological year she did after finishing school. Contemporary to her studies at Greifswald University, she spent every vacation participating in various bird-research projects, mainly with a focus on bird ringing. While she was searching for new challenges, Michael drew her attention to the under explored avifauna of Azerbaijan. Since her first visit to the country in 2015, she is working on pushing forward the environmental awareness and bird conservation as well as broaden the preliminary knowledge of birds in Azerbaijan. 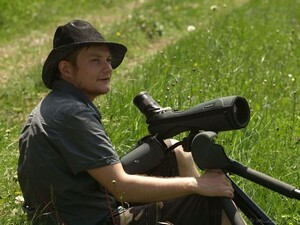 Michael Heiß is a passionate birdwatcher since his childhood. 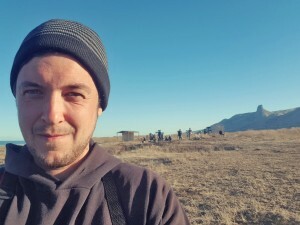 While studying at the Greifswald University in Germany he took the chance for a short-term internship in Azerbaijan, where he discovered the Besh Barmag bird migration bottleneck, a narrow coastal plain located between the Greater Caucasus and the Caspian Sea. Here, a huge amount of migrating birds is funnelled through the plain every spring and autumn. After finishing his PhD about the Besh Barmag bottleneck, he is now eager to promote the site for a scientific long-term monitoring programme.